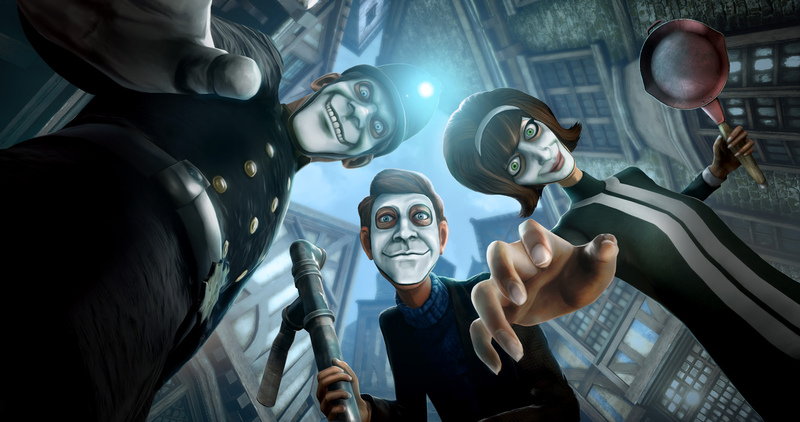 WE HAPPY FEW Teaches Us the ABCs of Happiness In this Extended Trailer! I’ve been dying to talk about this for a few days, but the news just keeps on coming! WE HAPPY FEW is a new video game coming out in August, that could be described as a 60’s psychedelic nightmare. Set in a post-war England, no one wants to remember the pain of the past, and they don’t have to with the invention of a new happy pill called Joy. Society became built around this Joy. Those who take it are engulfed in a terrifying level of euphoria that depletes empathy to the non existent. Users can be recognized by the white masks they wear to accentuate their smiling faces. If you don’t take your prescription you’re labeled a “downer”, will be brutally beaten by people with twisted up smiling faces, and then cast out into the broken down gardening district. If you want to fit in in Wellington, you have to take Joy so no one suspects you, but you must be careful. You can overdose. I have been waiting for this game for quite some time, I bought the early access back in 2016, and the actual release is finally happening next month! At first it was just supposed to be a small indie game, but they got so much support from crowdfunding and had so much to put into it, the price went up from the $30 range to a high end $60 range. Considering that I know about it, it seems well worth the price. There are three different stories you can run through in the game, in the early access version, you only have a glimpse into the character Arthur's story. His story begins when Arthur starts coming down from his Joy while doing his job of censoring any unhappiness mentioned in old newspapers. He comes across a news clipping that features himself and his brother Percy when they won a prize for “scrap gathering”, and is blindsided by auditory flashbacks of screams and remembers that he has a brother. From there, you’re given the option to take your next dose of joy. If you take it, the game ends right there. (I had to find out what happened if you did.) If you choose not to, then you and Arthur get to explore the real world together for the first time, and things get pretty dark and trippy from there. WE HAPPY FEW comes out August 10th for PS4, XBONE, and PC! You can pre-order it now!